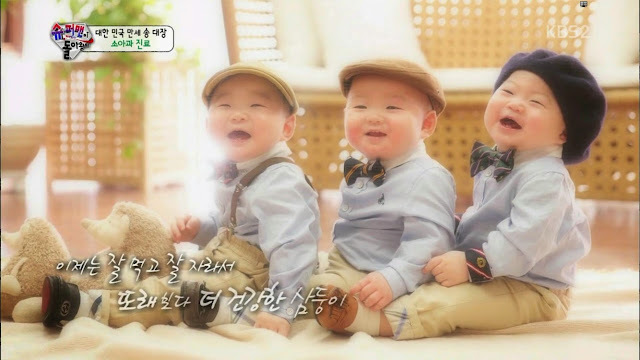 If you don't have a clue about the Song Triplets, then you might want to find out more. Beware: You might be suffocating from overloaded cuteness . Introducing from the left : Daehan the eldest, Minguk the second born, and Manse the third child. Their parents must be really grateful to have been blessed with not 1, not 2 but 3 adorable children. I guess that's why the triplets are given these names. I mean come on, what are the odds of getting triplets? Getting a set of twin is already rare, Ilk Gook is one of the luckiest man on earth. 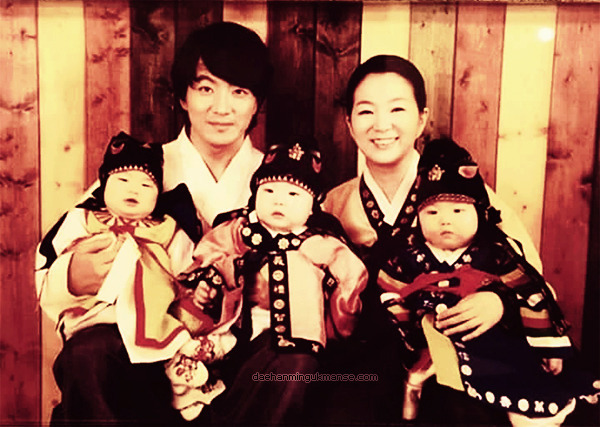 The Song Triplets first appeared in the Korean reality show "The Return Of Superman". In the show, the dads (there are also other families) have to spend 48 hours with the kids without their respective mothers. The crews won't be assisting them, so the responsibilities are all on the dads. This is actually quite a difficult task as the children are usually attached to their mothers. That's why these dads are called Superman. Screenshot taken from the first appearance of the Songs with their handsome dad in Ep 34. Born from the same body, but having totally different personality. It doesn't take long to recognize their distinctive faces. 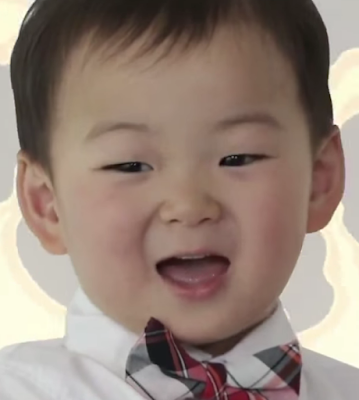 Let's start with Min Guk, my most favorite. He is the cutest among his brothers! I just felt like want to pinch his chubby face every time I saw him. He is often seen singing. He has really good memory compared to his brothers. He is the first one to sing the english version of Twinkle Twinkle Little Star which shocked his father. He is an aficionado of dinosaurs, he can point out all the long complicated names of dinosaurs, even I as an adult have difficulty in memorizing the species. Oh, he also eats the most, hence weighing the most, I'm a wee bit concern about his physical look in the future. Next, Daehan the liable one. At first Daehan didn't caught my attention, unlike his dongsaengs/younger brothers, he doesn't quite show off with singing skills or memorizing skills, that's why he always get the least scenes in the show. However, I slowly realized that Daehan displayed an amazing characteristic of a leader. He is probably aware that he is the eldest and has the responsibilities to take care of his brothers and also his dad. In a few episodes, when Il Gook is tired and resting on the ground, he will be the first one to ask his dad "Apa kwen cha na yo?" (Dad are you okay?) He didn't cry during a visitation to the clinic, he bravely accepted his injection without Il Gook by his side. Daehan is the first one willing to share his food with them, and also his father. Thirdly, the youngest and mischievous Manse! I would describe Manse as convivial and the most recalcitrant one. 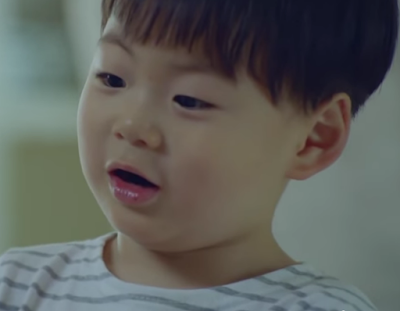 Manse can easily befriend anyone, especially girls. He just couldn't stop hugging and smooching Sarang! He might become a homme fatale in the future. Gee I wonder if he got this trait from his father? He always does the exact opposite of Il Gook's order and finds joy in doing so. I think in terms of bravery, he definitely ranks the first as most of the time, he is the first one who try out new things. The Song Triplets are huge eaters, just like their father. In one of the episodes, they can eat up to 10 whopping trays of dumplings! They eat everything that is served on the table, Maetuggi/grasshopper (deep fried), blood sausage, eel, western food, ribs, rice with vegetable, anything, you name it.Their parents did a great job in training them not to be picky on food. My mum says the triplets should start their potty training as they are 3 already. Apart from that, Il Gook and his wife have a unique way on disciplining their children. Facing-the-wall-to-reflect-rule, the 10 second rule, kiss-and-hug-after-you-have-a fight-with-each-other-rule, and guess what, these rules are very effective and are imitated by parents all over Korean after watching the show. They are very obedient, they sat there quietly for 5 minutes. These cute little angels are just too irresistible! Their interactions, their funny silly questions, even Ilk Gook's contagious laughter will boost your body's serotonin level. I find it really helpful for depressed people to watch the show. I have finished all of their episodes within 2 weeks because I only watch their parts, I'm not interested in other families. Now I have to wait one episode per week which is so tantalizing and agonizing, urgh! Can't wait for the next episode to be aired. So what are you waiting for, let the heart melting experience begin. All available in youtube.